Build a list of references to edges (as GeometricalQuadEdge::RawPointer) each one representing a different boundary component. Each resulting edge has the surface on its right and is hence ready for an walk on with the help of QEPrimal::IteratorGeom::BeginGeomLnext(). 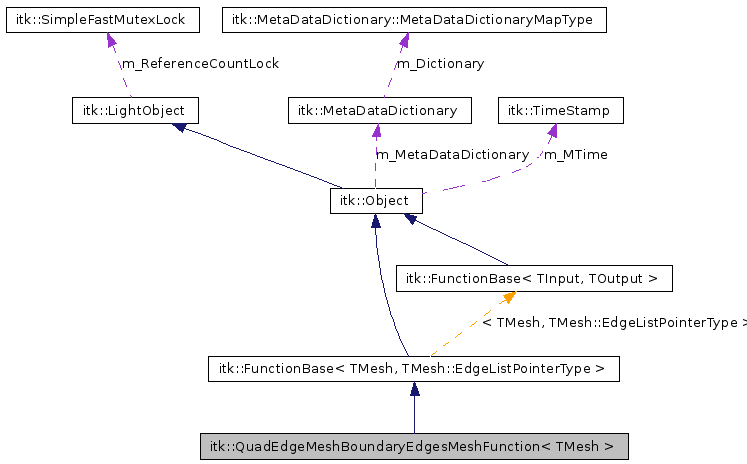 The size() of the resulting list is the number of boundary components. Definition at line 53 of file itkQuadEdgeMeshBoundaryEdgesMeshFunction.h. 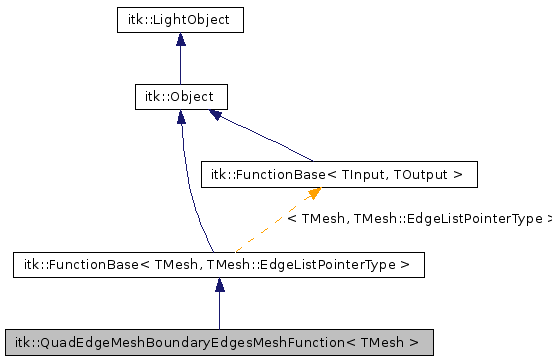 Reimplemented from itk::FunctionBase< TMesh, TMesh::EdgeListPointerType >. Definition at line 60 of file itkQuadEdgeMeshBoundaryEdgesMeshFunction.h. Definition at line 72 of file itkQuadEdgeMeshBoundaryEdgesMeshFunction.h. Definition at line 73 of file itkQuadEdgeMeshBoundaryEdgesMeshFunction.h. Definition at line 66 of file itkQuadEdgeMeshBoundaryEdgesMeshFunction.h. Definition at line 70 of file itkQuadEdgeMeshBoundaryEdgesMeshFunction.h. Definition at line 67 of file itkQuadEdgeMeshBoundaryEdgesMeshFunction.h. Definition at line 59 of file itkQuadEdgeMeshBoundaryEdgesMeshFunction.h. Definition at line 71 of file itkQuadEdgeMeshBoundaryEdgesMeshFunction.h. Definition at line 58 of file itkQuadEdgeMeshBoundaryEdgesMeshFunction.h. Definition at line 62 of file itkQuadEdgeMeshBoundaryEdgesMeshFunction.h. Definition at line 81 of file itkQuadEdgeMeshBoundaryEdgesMeshFunction.h.